EPISODE THREE, SEASON TWO- "SMOKE AND MIRRORS"
Tonight's episode was a little surprising because it was part next episode and part prequel. We learned the events of how Peggy Carter got recruit become a British Agent and the lows she suffered in order to find herself there. Not only did we learn more about Peggy's life, but also Whitney Frost. Frost's real name is Agnes Cully and like some other characters in the MCU, she rose to being a villain because a horrid homelife. And well, she is a Frankenstein Monster of sorts from the first episode. I thought it was a great way for us to learn more about these characters and it seems to be playing into their story arcs for the show itself. Whitney Frost also showed her husband, Chadwick her new secret. She revealed that she had superpowers she gained from the zero matter in the first episode. She spent most of the episode testing her powers on rats, seeing if she could somehow control her powers. But it was of no use, she can't really harness them yet. But instead of staying persistent, she uses them for her own ends. 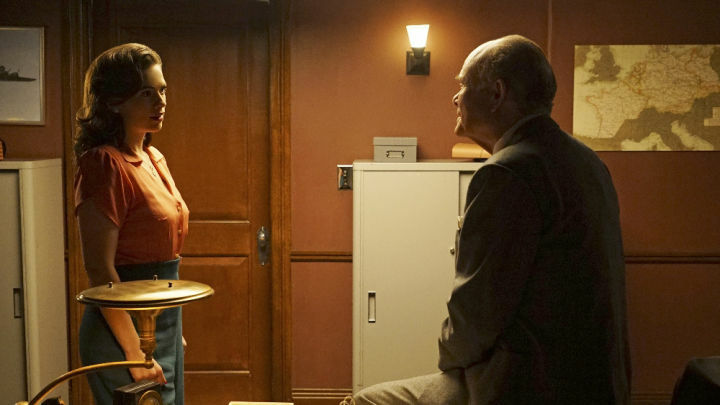 Most of tonight's episode had to do with Peggy capturing someone in close league with Chadwick and the man Peggy caught decided to spill the beans on Chadwick. In order to protect themselves, Frost killed the man with her powers. Frost has now fully assimilated herself into her villain role and it seems the inevitable showdown between her and Carter will be a dozy. Some part of the episode was dedicated to the FBI overseeing the SSR missions, including the mission Carter has tasked herself with. The person leading this overseeing job is Vernon Masters, the character Kurtwood Smith plays. We learned last week that Masters is in league with Chadwick, so all the intelligence Masters gathers is going to aide the bad guys, but its clear the good guys haven't figured that out yet. I think this plot line could end up going somewhere in this season. But the idea of the bad guys subverting the good guys is starting to become cliche in the MCU. I have to remember though, this pre-Avengers time and S.H.I.E.L.D. hasn't even been invented yet. Lots of people online think the social club Chadwick belongs to is actually HYDRA. While I think its a little too early to tell, I could be wrong. Perhaps we will find out how HYDRA was able to slowly and systematically build itself inside S.H.I.E.L.D. and that could be something exciting to watch unfold. I have to say that I really liked the angel of using flashbacks to both flesh out our characters and put more reflection upon the current story line. It is not always easy to do, and tonight's episode was both innovative and informative. The writing was very well done for this episode, which made the flashback scenes even more heartbreaking. We know what these characters have lost to become who they are now, and now we also know how hard they are fighting for what they are fighting for. It was a powerful choice that I think paid off tonight. I was glad to have seen it and it was another good episode.